*This is a sponsored campaign written by me on behalf of Dove Advanced Care Antiperspirant and WeAllGrow Latina. However, all opinions expressed are my own. Everyday as woman we each have a routine to getting ready for the day. We wake up to start our daily routines and conquer the day. Some may start the day with yoga or exercise, others my start with reading emails and coffee, while others start off by getting their families ready. What ever routine you may have there is no doubt that as woman we all want to feel confident and fresh. For me my routine includes a shower every morning and making sure I have my Dove Advanced Care Antiperspirant Deodorant. I make sure everyday to apply deodorant to prevent any wetness or order from the days stresses. Every woman has their daily must have products they can't leave home without. 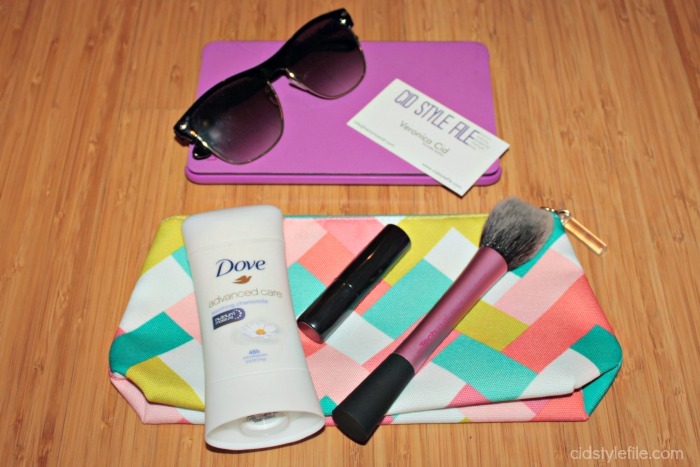 Some of my daily essentials, Dove Advanced Care, lipstick /makeup, sunglasses, tablet and business card. Dove knows woman have a strong connection with personal care products, using numerous products every day. This is why Dove conducted a survey with Latinas all across the US to get a better understanding about their daily beauty routines. 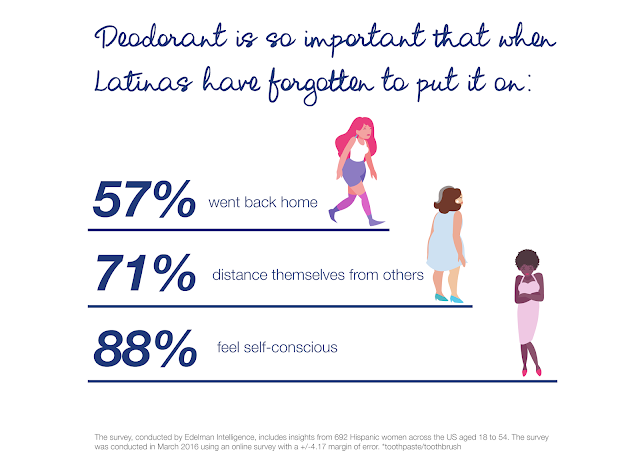 The survey revealed surprising results, deodorant was the one thing they never want to skip and it made Latinas feel more confident when wearing it. Forgetting to wear deodorant can greatly impact their confidence and made Latinas feel self-conscious, causing them to shy away from others. I know it does affect me, if I ever forget to wear deodorant it will make me feel very self-conscious all day long and worry about order. I have always been super conscious about order and never want to be the "stinky" one. We all have things to worry and stress about in our daily lives, wetness and order shouldn't be one of them. I'v been using Dove products for several years and recently had the opportunity to try out the Dove Advanced Care Antiperspirant Deodorant. The deodorant comes in several scents like soothing chamomile with 48 hour protection to keep order and wetness away. Dove Advanced Care contains NutriumMoisture which helps keep your underarm skin smooth and soft. I really enjoyed the soft and subtle scent of chamomile, which isn't too strong and over powering. My underarm skin has felt very soft and hasn't stained my clothing at all. I definitely felt protected and fresh using Dove Advanced Care. 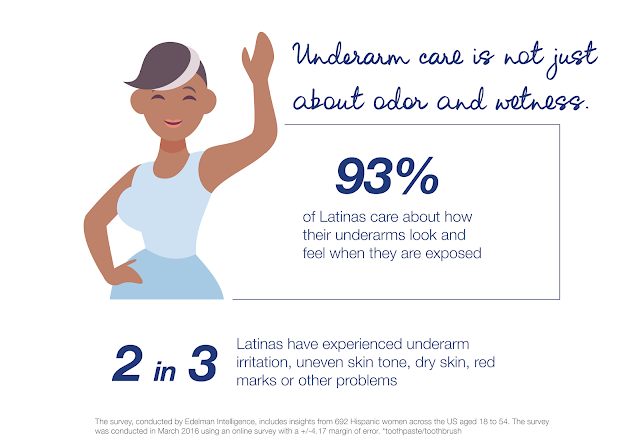 The Dove survey reveals as well that Latinas care about how their underarms feel and look. Many woman have experienced irritation, dry skin, uneven tone and other problems. So when you can use a product that helps with order, wetness and can make your underarms look and feel better its a winning combo in my book! Deodorant is one of those products we all use and need, but we don't talk about often. It's an essential personal care product that gets overlooked. However what if you can get more than just odor protection. Choosing the right deodorant/antiperspirant can be an essential upgrade to your daily beauty and personal care routine. As woman we wear many hats everyday, always taking care of everyone around us. Isn't time we took care of ourselves, using products like Dove Advanced Care is a small way to care for ourselves and not settle for anything less. Just a simple thing like using a deodorant that protects you for 48 hours from wetness and order along with making your skin soft and smooth can be the difference you need in your personal care routine. How do you upgrade your daily personal care routine?